Getting ready to defend your title is hard enough without your trainer and your manager fighting, but there's trouble in Alexander Povetkin’s training camp ahead of his WBA title defence against Marco Huck. Ron Borges of the Sweet Science reported that the Povetkin team is unhappy with Teddy Atlas’ refusal to join the “champion” in his Moscow training camp. While no fighter wants to be without his trainer, Teddy has a point here. The pair have an agreement where Povetkin trains in the US, allowing Atlas to juggle his responsibilities as a boxing coach and ESPN commentator. If that's what they agreed, what can you say? Atlas isn't going to give up his ESPN role where he is an established voice of boxing, and he likely gets paid a lot more by ESPN than he does Povetkin. Maybe he and Alexander just aren’t a tight fit, and all this could come to a head if Povetkin asks Atlas to choose between training and commentating. Povetkin has the most to lose here; Atlas’ coaching pedigree has been shown in success with Michael Moorer and a stint in ex-featherweight champion Barry McGuigan’s corner. Finding a top trainer who can nurture your style is difficult, especially on such short notice. 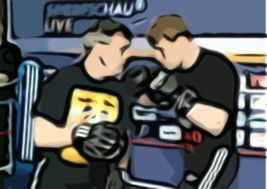 Povetkin may have to do without Atlas for the Marco Huck fight, but he will likely make concessions after rather than issue an ultimatum and risk losing his mentor. "We spoke yesterday. We have a dispute and I think that by the end of it, Atlas will fly to Russia,"
It’s too early to talk about them splitting, and this isn’t a soap opera so I don’t want to speculate too much on that. Suffice to say that if they did, it would be after the Huck fight. Atlas isn’t a hot-headed amateur who splits when he doesn’t get his own way. Knowing the deal the two had, where the training camp accept Atlas’ absence when he is working for ESPN, I can only guess that the comments to the media are an attempt to force a change in terms. As a fighter Povetkin needs attention and consistency in his camp and while this kind of conflict wouldn’t have affected him against someone like Cedric Boswell, Povetkin’s last fight, Marco Huck might have something more to offer. They're not the first boxer-trainer to fall out though; in 2010 Ricky Hatton had to settle a wage claim with former trainer Billy Graham and Floyd Mayweather has had endless tussles with uncle Roger. The difference is that Hatton was retired when he sorted through his issues and Floyd Mayweather is Floyd Mayweather. Povetkin is just under a month away from his defence against cruiserweight champion Huck, and he can’t afford to have these distractions around him. That said, a Povetkin-Atlas split could force some change in the heavyweight division. It is well known that Povetkin was lined up to take a shot at the Klitschkos years ago but Atlas pout a stop to it, feeling the Olympian wasn't ready. With Atlas out of the picture there's no doubt he'd take one of them on, and you know what? Out of all the heavyweights available, he's got a better chance than most.